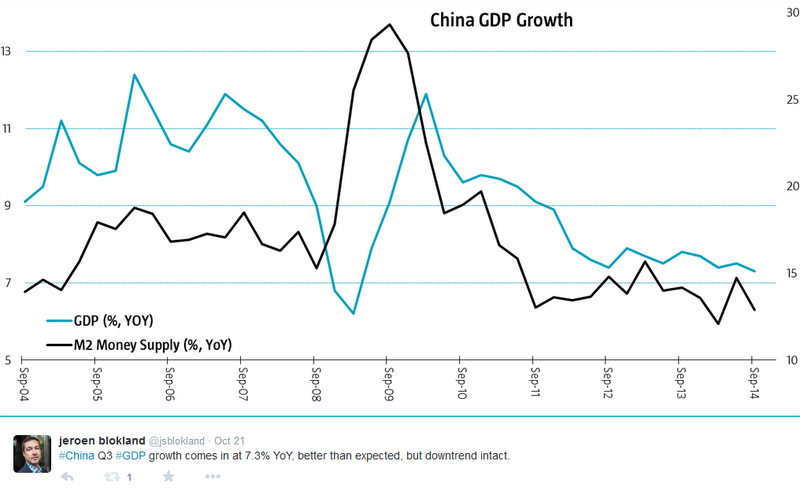 The latest data on the property market emphasize the slowdown in Chinese housing. In September, prices of existing homes decreased in all of the major 70 cities that provide monthly statistics. The Eurozone proved resilient. 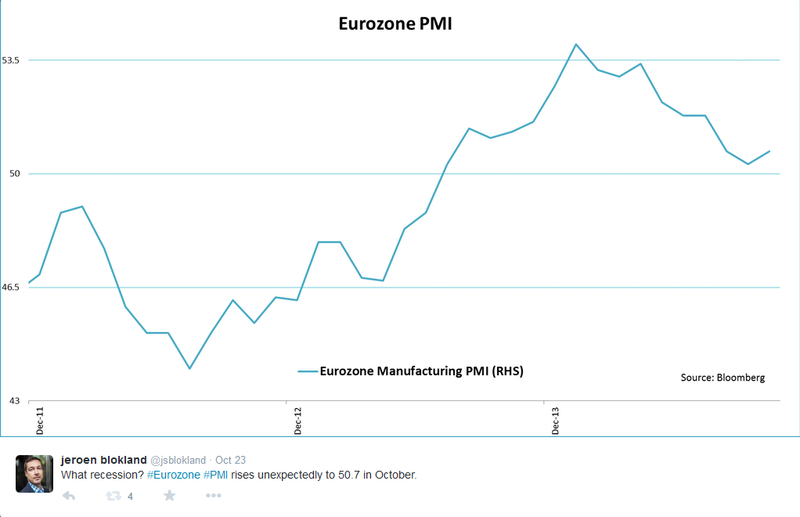 The manufacturing PMI surprised on the upside and managed to stay above the (mentally) important threshold of 50. Expectations that the PMI index would fall below that level for the first time since June 2013 were defied. A recession does not have to be the base case for the Eurozone. This Week End Blog comes with a bit of chauvinism. 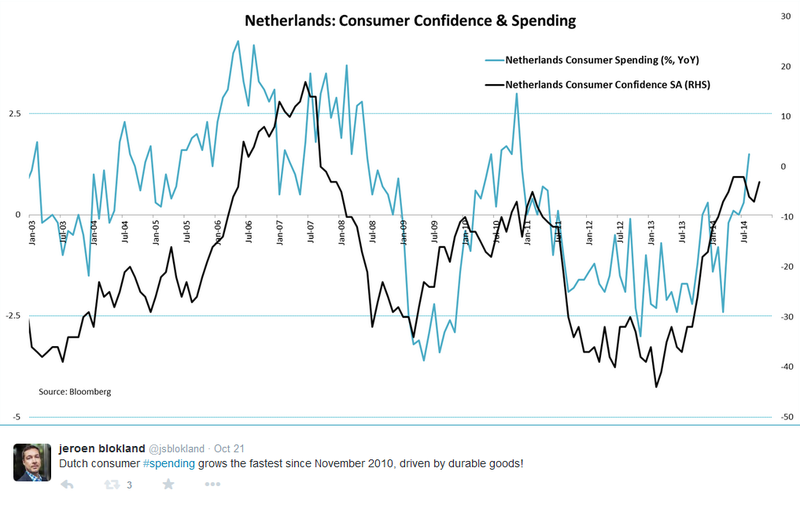 In addition to the surprise Eurozone PMI number, Dutch consumers increased their spending by the most since November 2010. Equally important, the rise in spending was fueled by sales of durable goods, traditionally a sign of confidence. But not all was great, it is still Europe, of course. France, again, applied for the role of sick man of Europe. The Manufacturing PMI collapsed to 47.7, near the low of the year. 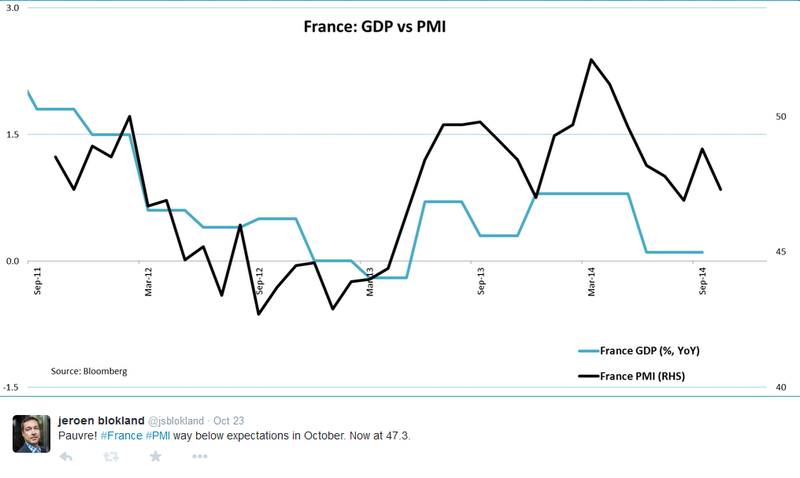 France has never had the magic export mix of Germany or the Netherlands, and now with the euro down, this could hamper business confidence. 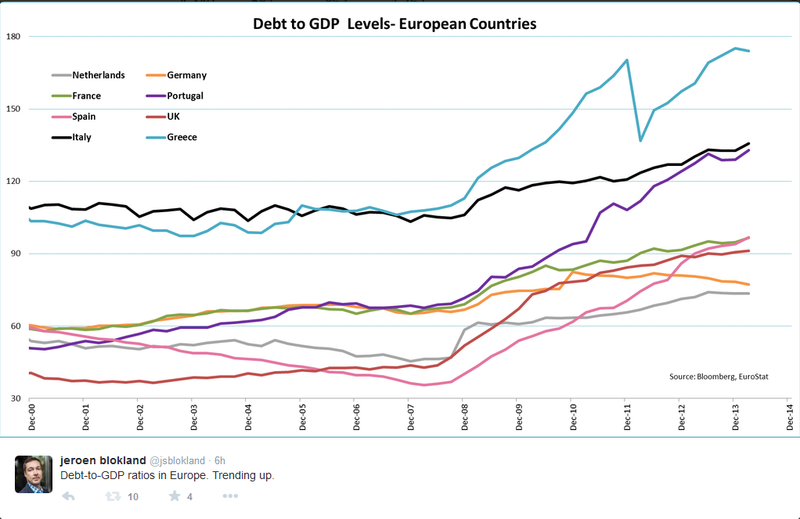 And then there is European debt. Debt-to-GDP ratios increased in Q2 2014, data published by Eurostat show. Leading the rise in the debt-to-GDP level was Italy, already one of the most indebted nations within the Eurozone. This could lead to renewed peripheral turmoil, especially when budget deficits are not kept under control. 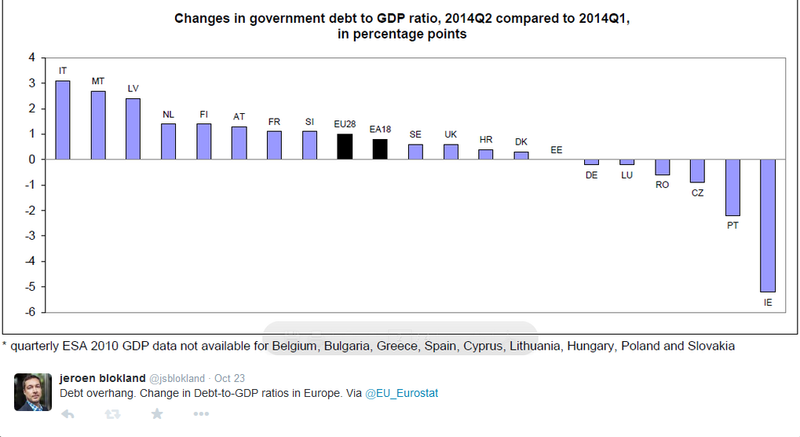 The graph below visualizes the debt issues of (some of) the Eurozone countries. Greece remains the ultimate leader when it comes to debt, but Italy, with a debt level of more than 130% of GDP, is not that far behind. Also worrisome is that the trend is most certainly up, and not down. Let’s move over to financial markets. 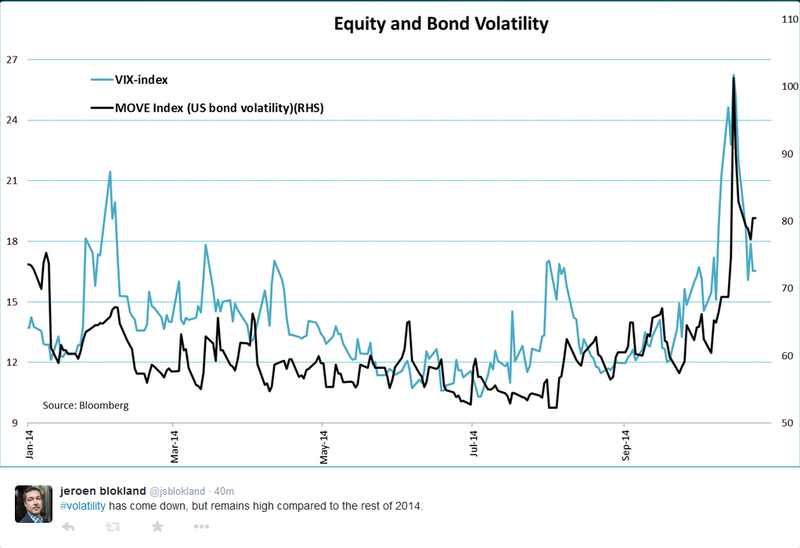 Volatility decreased substantially this week, as equity markets recovered. Compared to earlier this year, however, things are still looking pretty shaky. The increase in volatility raises the question, well at least with me, how do equity markets behave once volatility has spiked. It turns out pretty much the way you would expect. The average daily return for the S&P 500 index for all days that volatility resides above 25 is 0.16%. But it is important which way you are going. Above 25 and going up will on average lead to a daily negative return of the S&P of 1.43%. But, if the worst (at least for one day) is over and volatility comes down, stocks generate a positive return of 1.09% on average. 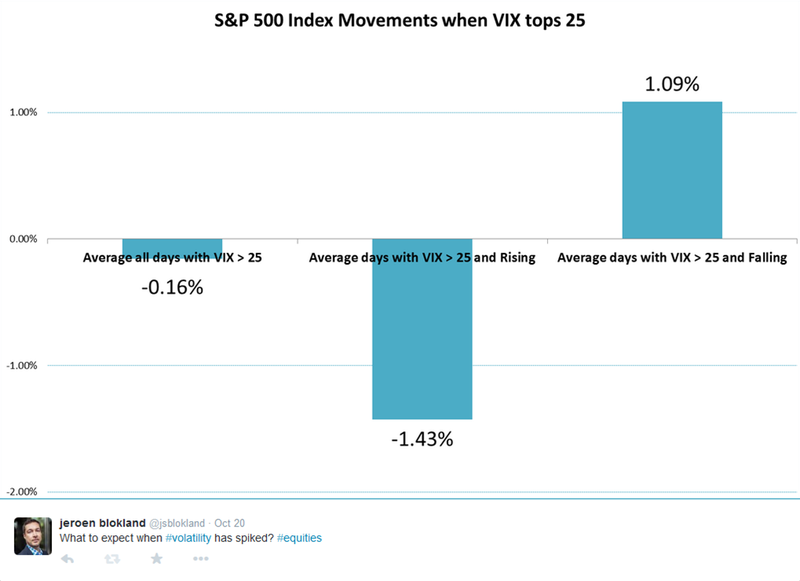 I will pay some more attention on equity returns and VIX movements in a blog next week. This week I already focused on the issues that come with investing in volatility. To summarize, going long in volatility, through options or futures, will result in a loss (again on average). Going short volatility does generate positive returns in the long-term, but it does not hedge your volatility risk you bear when investing in equities. On top of that, this strategy is highly volatile itself. 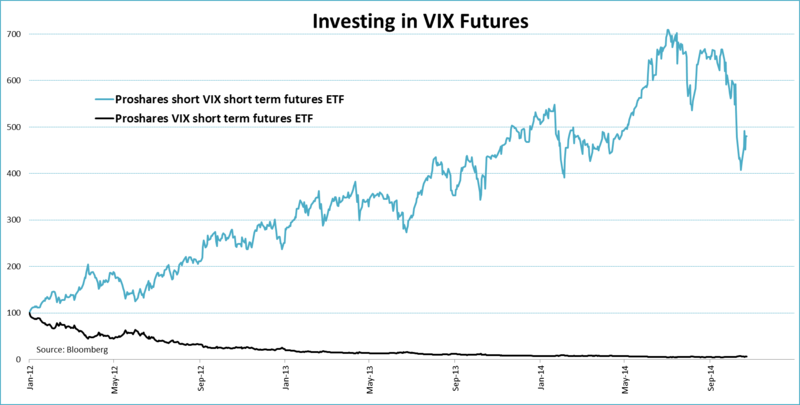 To read all about the implications of investing in volatility read here. There is still a lot to do about inflation. 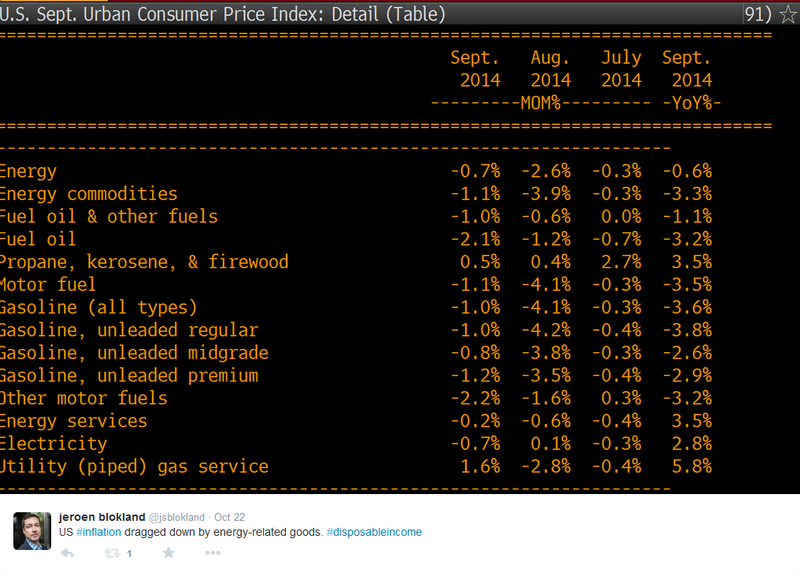 In the US, inflation in September equaled 1.7%, a little higher than expected, and steady from last month. What’s important to keep in mind is that part of the low inflation is related to energy prices. Oil is back to USD 80 and gasoline prices have tumbled 30% since June this year. 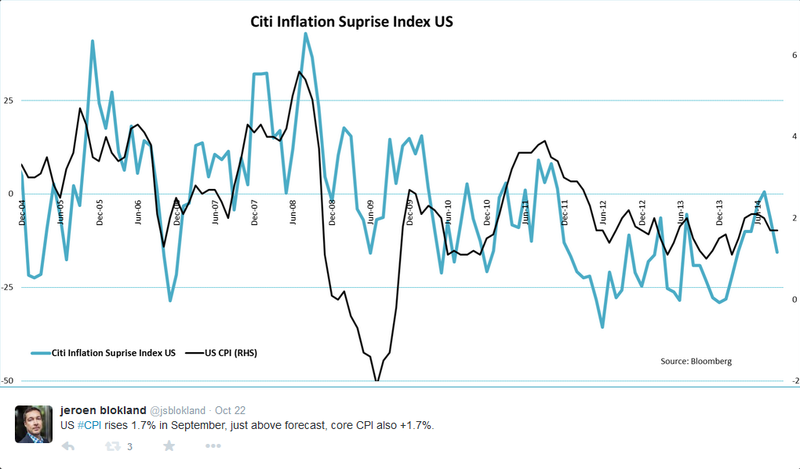 While this drags down inflation it also provides a windfall for US consumers. A windfall of USD 60 billion to be precise. It’s comparable to a tax break, which get spend most of the time, hence improving domestic demand. 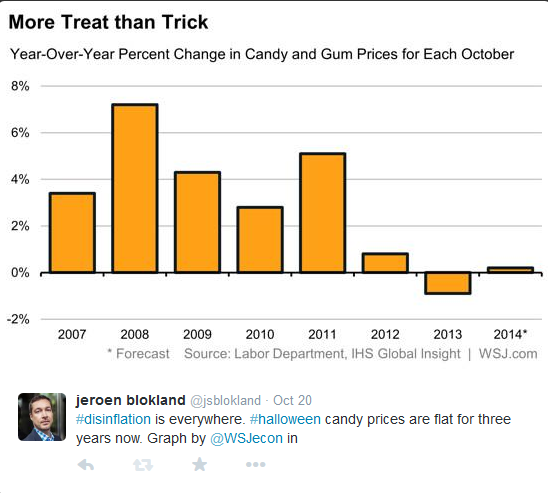 Oh, and since next week is Halloween, just so you know, prices of candy have been flat for three years now. Trick or TREAT, then! Talking about falling prices. The prices of fine wine are also down in recent years. Combine this with the notion that many of finest bottles of wine have been bought by the, ever richer, Chinese and you get this graph. 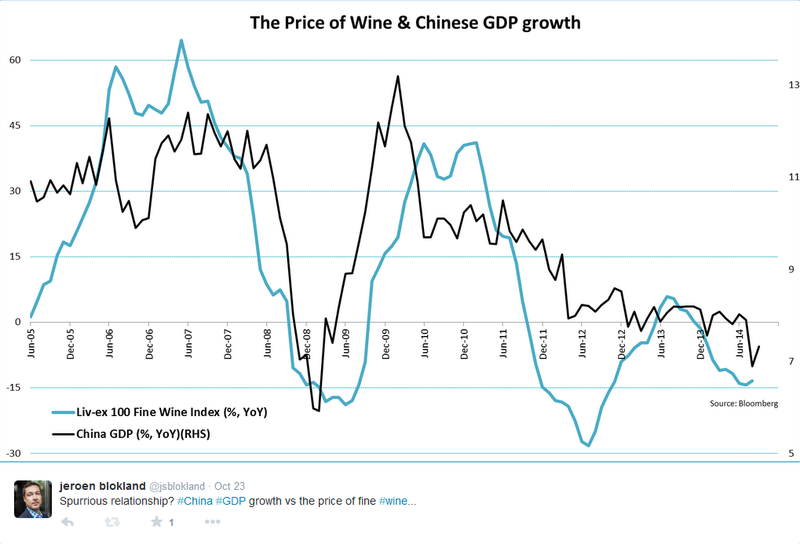 Spurious or not, Chinese GDP growth and the prices of fine wine are positively correlated. As mentioned above this Week End Blog comes with a touch of chauvinism. Check out the great graph, made by the Economist below, showing the richest countries over time. 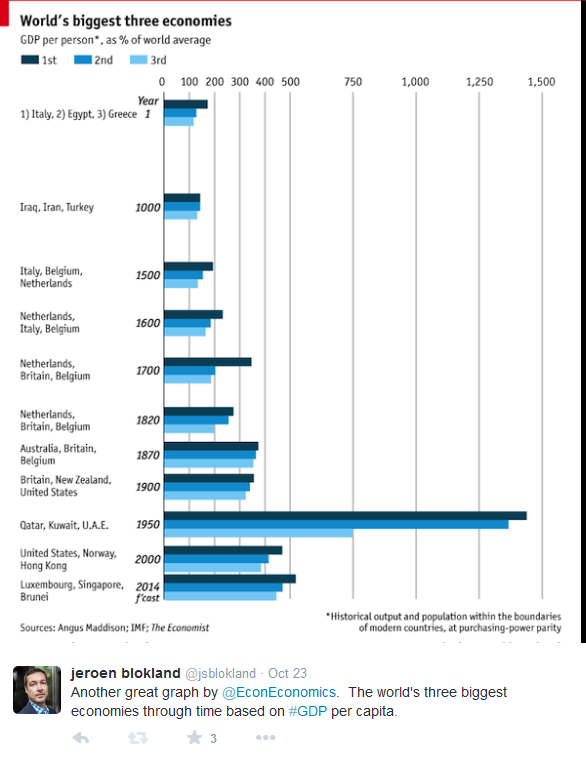 For almost three and a half century the Dutch belonged to the richest people on earth. Thank you again for reading and until next week. Enjoy your weekend.